Dr. James Malouf is a certified provider of Invisalign in Brisbane since 2011. Since then, Dr. James Malouf has completed a large number of Invisalign cases to straighten teeth successfully, even those with very complex cases. Invisalign is a teeth straightening method which uses modern 3-D computer imaging technology to develop a series of invisible and custom made plastic aligners of a patient’s teeth and smile to develop a corrected and new smile design. Invisalign is an aesthetical and comfortable alternative to braces. There are no metal brackets, no wires and no bands required during your Invisalign treatment. You simply put in a new set of aligners in your mouth over your teeth approximately every two weeks until your teeth are straightened and your Invisalign treatment is complete. Using Invisalign helps you achieve a straight smile without compromising your lifestyle activities including smiling. convenient alternative for patients seeking a solution with minimal impact on their social or professional activities or lifestyle. Invisalign is so discreet that no one will notice. More Comfortable Where braces are irritating and uncomfortable, Invisalign is smooth and barely noticeable to wear. The smooth, soft plastic is gentle on sensitive areas of your mouth and because they are designed to fit your teeth they have little, if any, discomfort. Invisalign works by applying a small amount of force to gradually move your teeth into place rather than using the more intense pressure of braces. As your teeth move, you are given a new set of aligners to continue the process until the treatment is complete and you can enjoy your straight new smile. Preview Your New Smile Due to the 3D modern technology, Invisalign also allows you to preview your new smile design before you commence treatment and allows patients to be engaged and make suggestions before your treatment begins. Removable Eating, brushing and flossing is very difficult for people who have braces. You can’t eat certain foods because they damage your braces and food is harder to remove when brushing. With Invisalign, you can remove your aligners to eat your favourite foods and clean your teeth as you usually would. There is no restriction on the food you can eat, you don’t have to worry about having food particles stuck in your braces and cleaning your teeth doesn’t have to be frustrating. Dr. Malouf has completed a large number of Invisalign cases. He is a leading cosmetic dentist and renowned for his meticulous execution with orthodontic treatments in Brisbane. Dr. Malouf has years of orthodontic experience and unique qualifications in cosmetic dentistry, coupled together he has become one of Brisbane’s leading dentists for straightening teeth using Braces and Invisalign for a range of complicated cases including overbite, crowding and spacing issues. Teeth misalignment can create a range of health concerns including oral health care issues as well self confidence issues. For more Invisalign before & after images click here. Dr. James Malouf will be able to provide a complete treatment plan as well as Invisalign cost for your review. However, to provide you some idea of price, Dr. James Malouf has provided some Invisalign cost approximations based on the complexity of the cases. Book a Consultation for Invisalign in Brisbane with Dr. James Malouf. In most cases Invisalign treatment is completed in one year. For more complex cases you will need to consult with your dentist. Is Invisalign quicker than braces? Yes. Invisalign usually takes half the time to get the same results as braces. Invisalign is uniquely designed to straighten teeth with a more gentle force and less intrusive material. Patients may experience some discomfort due to movement of the teeth, however this is significantly less than you would experience with braces. Yes, interest free payments are available for eligible patients. Contact us on the details below to book a consultation or fill out the contact form to book a consultation and find out if you are eligible. Can I take Invisalign out to eat? Yes! One of the main benefits of Invisalign is that you can take the aligners out to eat and brush your teeth. No restricted diets and irritating teeth cleaning procedures. Can I get Invisalign if I have crowns or veneers? Invisalign is an innovative teeth straightening treatment that works with crowns and veneers. If you have another condition we haven’t covered please feel free to contact us on the details below for more information. Can you close spaces with Invisalign? Yes. The aligner sets for your treatment can be created to take spaces into account and close them. In most cases invisalign is more expensive than braces, however it is still a popular treatment choice due to the faster results, aesthetic appeal and convenience. Invisalign isn’t dependant on age, however if you have a condition that you think might affect your eligibility please contact us on the details below and we will inform you if this will be an issue. What if I need faster treatment? 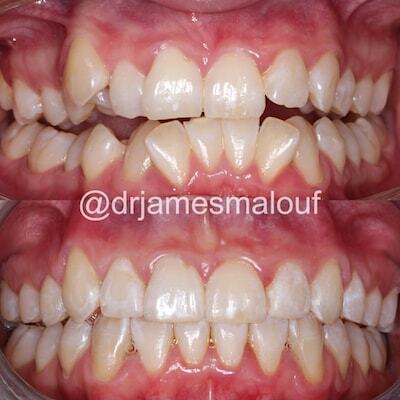 If you need your teeth straightened on a deadline (e.g. a special event), we can accelerate the process using Acceledent. Acceledent is a simple, hands-free device that uses gentle micropulses to accelerate teeth straightening up to 50%. Malouf Dental offer this device at the competitive price of $1320.